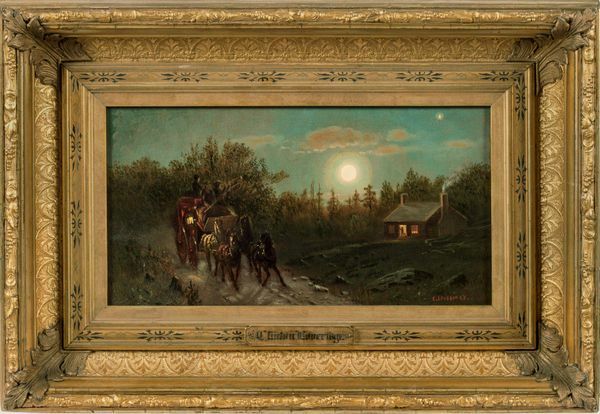 In this painting, galloping horses pull a carriage along a rural road in the moonlight. As the carriage passes a small cottage nestled in a forest clearing, the passengers trumpet a greeting to the inhabitant, whose darkened silhouette reciprocates the gesture with a wave from the illuminated doorway. The dramatic setting painted in a dark palette may seem atypical for Loveridge, who is known for his idyllic countryside landscapes featuring cattle or sheep lazily grazing in pastures or wading in streams. However, this picture is one among several paintings that Loveridge explores the light effects of moonlight on a landscape. 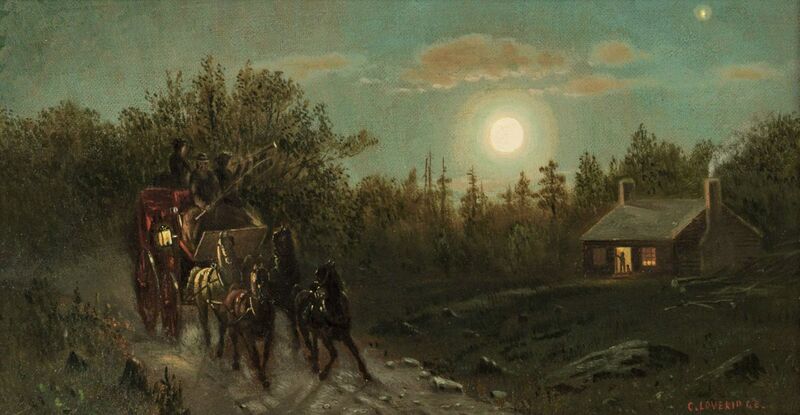 As rays emanate from the full golden moon and cast shadows upon the horses on their path, Loveridge heightens the effect of light and shadow by placing a bright lantern on the side of the carriage, further illuminating the scene. The glow radiating from the small cottage adds a warmth to the otherwise cool palette. The lighting also gives the cottage a welcoming presence, which is reinforced by a puff of smoke arising from the chimney, suggesting a warm and inviting hearth inside.